One of the most elegant (and easy!) appetizers you’ll ever have the pleasure of meeting. 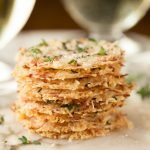 These delicious Italian-inspired crisps pair wonderfully with cocktails, and are fabulous on salads or as soup toppers. Happy almost 2017! Popping in today to share one last recipe you just might need to ring in the new year. I agree with her wholeheartedly. They’re incredibly delicious, and yet light enough to not spoil the main course. I have a little “thing” about people filling up on the appetizers and not having much room for a lovingly-prepared meal. The ingredient list is pretty much complete in the title of the post. There’s a tablespoon of flour that’s added, just to help everything hold together. Other than that, it’s Parmesan cheese (good quality), fresh thyme and sea salt. You might think Parmesan is salty enough on it’s own, but don’t omit the pinch of sea salt. I tried that and it just wasn’t the same. And the technique is so simple you won’t believe it. 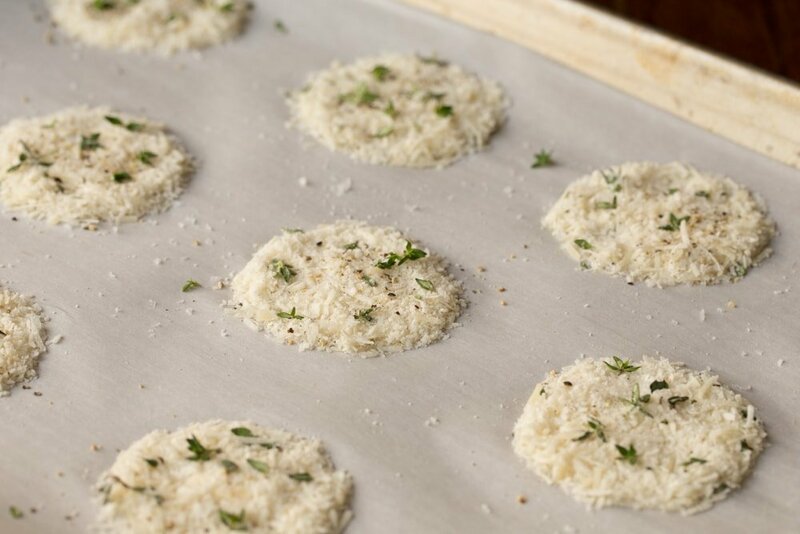 Just combine the Parmesan, flour and thyme and scoop out tablespoonfuls onto a cookie sheet. Bake for 8-10 minutes, then let them cool. That’s it! 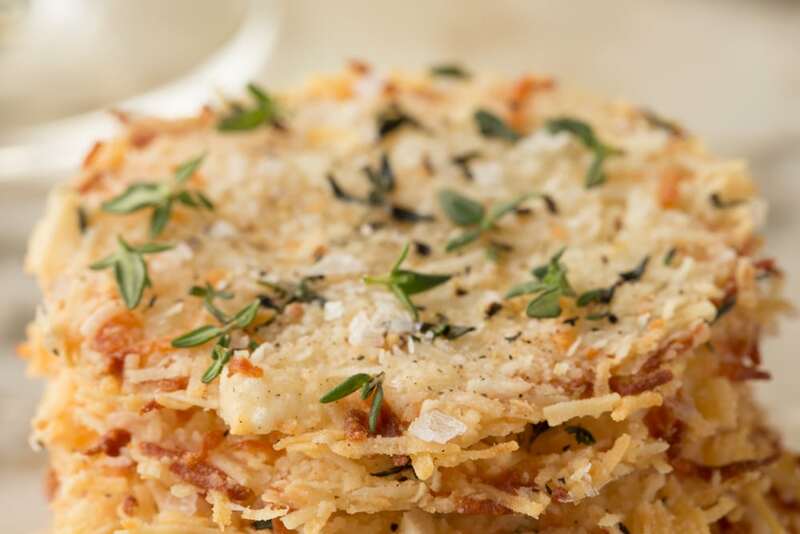 Ina says to grate the Parmesan quite coarsely (like you would carrots). I tried that too, and like the crisps better grated with a medium coarse grater. I think they look prettier that way too. Ina also calls for kosher salt combined with the cheese mixture – which is fine, but a sprinkle of good sea salt right over the top takes them literally “right over the top”! Happy New Year! Can’t wait to share lots of deliciousness in 2017! Cheers! P.S. One last thing. These wonderful little bites are also great in or along side salads and as soup toppers. One of the most elegant (and easy!) 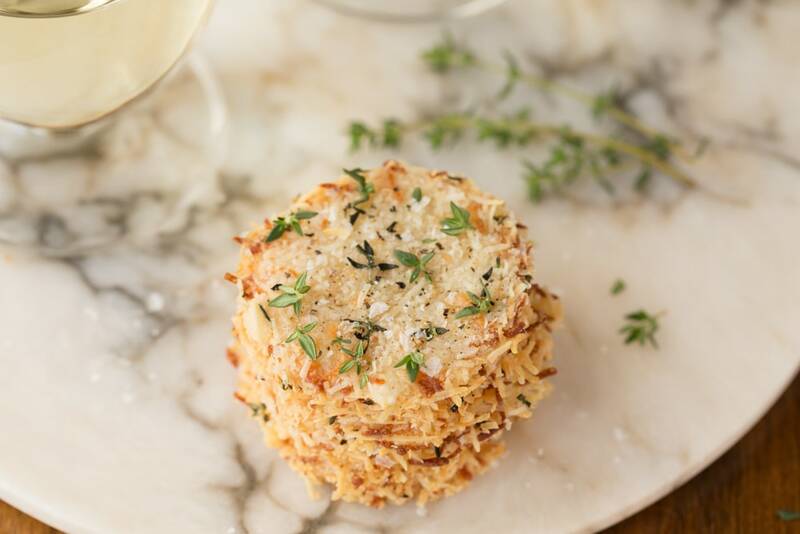 Italian-inspired appetizers you'll ever have the pleasure of meeting. A delicious little bite to go with cocktails, on salads or as a soup topping. 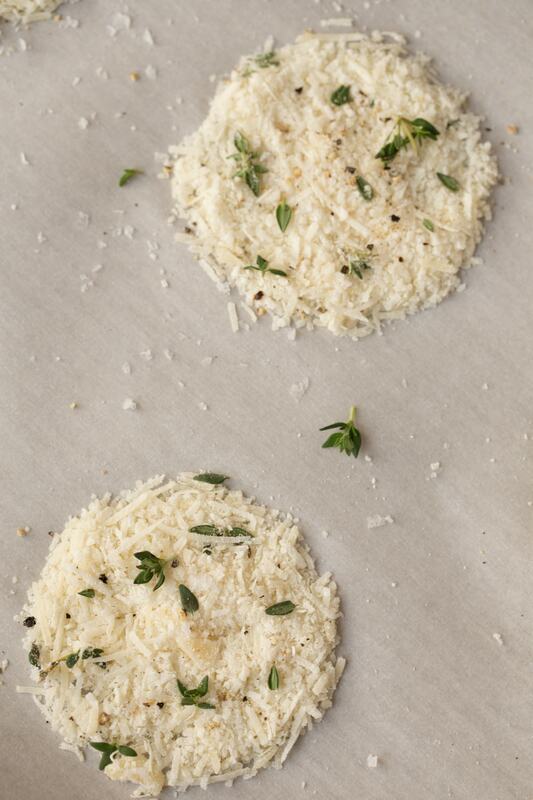 Combine the Parmesan, flour and thyme in a bowl and mix well. With a measuring spoon, spoon level tablespoons of the mixture onto the prepared sheet pans, spreading each round into a 2-1/2 inch disk. Toss the mixture each time and scoop from the bottom of the bowl to be sure you get some flour in each spoonful. 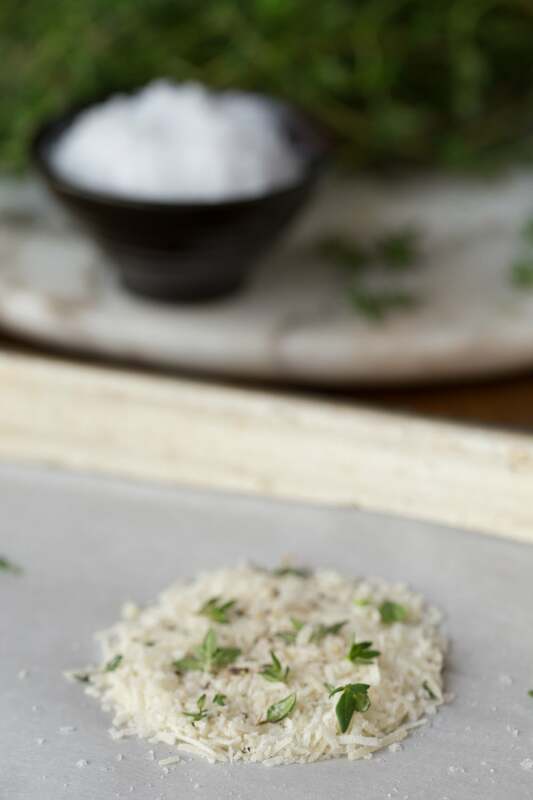 Sprinkle each little disk with a pinch of the flaky sea salt. I like to garnish with a few more fresh thyme leaves before serving. * I use a grater like this. ** Maldon sea salt is fantastic. It's a little expensive (as salt goes) but it's used as a finishing salt. Not a salt for every day use. It's delicious as a finishing touch to salads, sandwiches, main dishes etc. Take a pinch of it with your fingers and rub your fingers together as you sprinkle it over the food to bring out the wonderful flavor. These are so much better than the regular parm crisps we used to serve at the restaurant I worked at. I’ve made them several times and each time I don’t seem to make enough we like them so much! These are so easy and delicious, too.Yesterday, I cooked at the recipe temperature and time, but felt they needed to be cooked a little more. Today I warmed my oven to 250 degrees, placed them back in the oven, turned the oven off and left them in the oven without opening the door. They are wonderfully crisp and ready for a Super Bowl party. I loved the thyme and sea salt flavor. Great taste combination. Husband said these are really good!! Thanks, Jane! I love that they’re just kind of unique too! Have fun! Hi Wendy, just store them in an airtight container. Look fabulous – but we are a gluten-free family. Any recommendation on type of gf flour? I would just use whatever all purpose gf flour you prefer. I know King Arthur makes a good one but I’m not familiar with others. Just wanted to THANK You for always giving us fantastic recipes. I know if you post something, it will be good and not waste my money. This is by far, my favorite site. Nothing but the best is wished for you. Thanks again. Thanks for posting – they were fabulous! I made them in advance of a girls trip and massed them to the cheese board for a fun texture. They were a huge hit! So yummy and addictive! That’s awesome Karen, thanks for letting us know! These look wonderful! I want to make these for my son’s wedding. Can I make them a few days ahead or are they better the day of? Hi Ricki, They could definitely be made a few days in advance. I would just layer them with parchment paper in an airtight container. Congratulations! I’m going to try these for Valentine’s Day. Can you tell me how I would get emails to follow your blog? Terry, at the very bottom of the blog there is a place to subscribe. Since we just revamped our website, we’re still working on the right side. There will be another subscribe place there soon, so you don’t have to go all the way to the bottom. Being disabled, making the crisps seems a little daunting . I thought I would try to make something similar using Nabiso Good Thins. Will look today to see of they come already sea salted. Will let you know how they turn out. Hope you enjoy them Karen! What a great app! 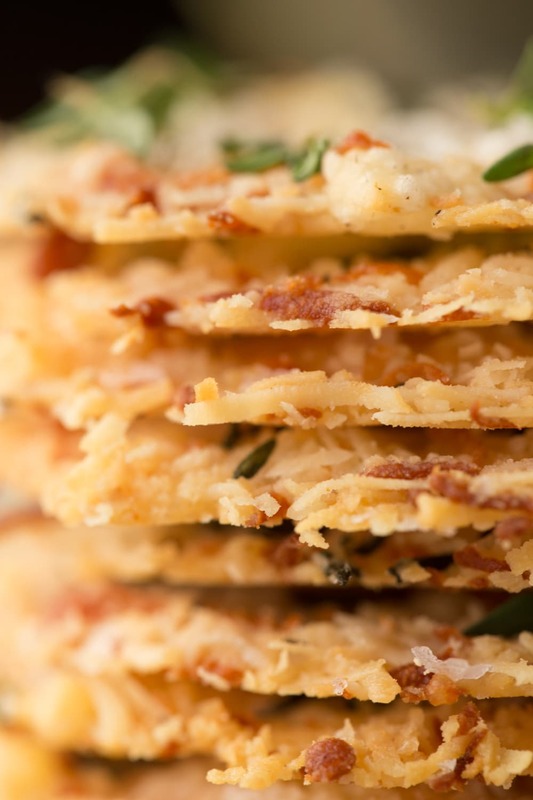 Your photos are marvelous and show all the detail in these thin little crisps. Happy New Year, Chris! Thanks for the wonderful encouragement Debra! Happy New Year to you too! Thanks so much Liz, Happy New Year to you! I love these crisps, what a perfect bite for entertaining. Happy New Year to you and Scott! Yes, they are a perfect little bite for entertaining Laura! That’s awesome Lita Marie! So happy you enjoyed them. Happy New Year to you! Happy New Year to you and your loved ones, Chris! These cheesy crisps look like a perfect party food! Thanks so much Angie, best wishes to you in the new year! Chris these look delicious and elegant. Ina’s recipes are always wonderful, love that you added thyme. Happy New Years to you and Scott. Wishing you the best in 2017. 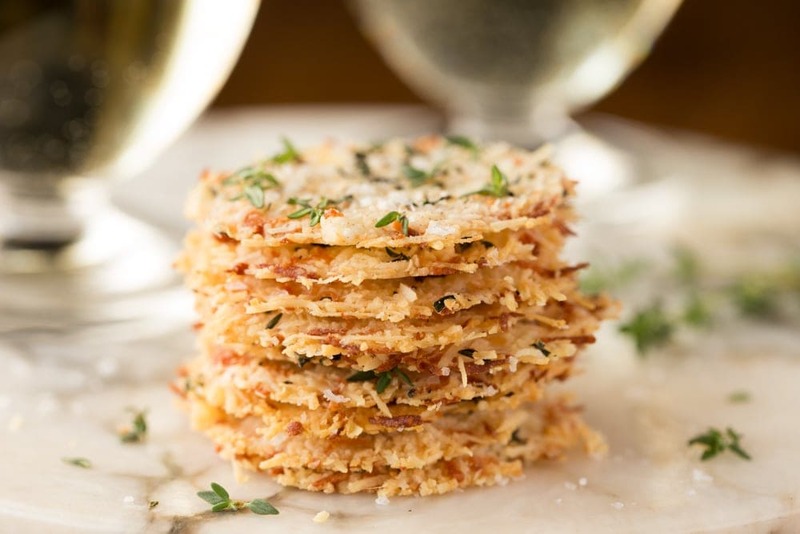 I love frico Chris, I must try this with thyme! We made some the other day in one of those non stick red copper pans, worked like a charm, slid right out of the pan in minutes- Happy New Year! Happy New Year to you Jenna! The thyme adds a wonderful touch! Such a simple and delicious appetizer Chris! I’ve seen these in the stores and never wanted to pay for them – so now I can make my own. Love the sea salt and herbs. Hope you and Scott have a terrific and very Happy New Year! Thanks Tricia, happy new year to you too! 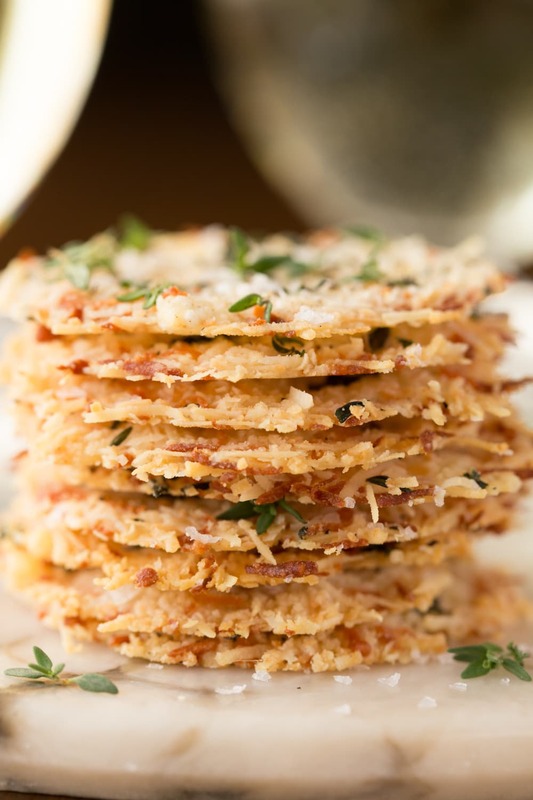 These are definitely much better and less expensive than the store bought frico! Chris, we buy parmesan at Costco, the real stuff. I already have a hermetically sealed glass jar full of parmesan which has been ground up pretty fine. Do you think this will work for the crisps?